THE RUMOR IS that sometime this year the young Mr. Mark Zuckerberg will be richer than…well, not Bill Gates, but richer than the late Steve Jobs. It will be the result of the first public offering of stock for Facebook–the business, web site, and cultural phenomenon created by Zuckerberg. Investors talk about it in terms of Visa and GM’s IPO–only more so. 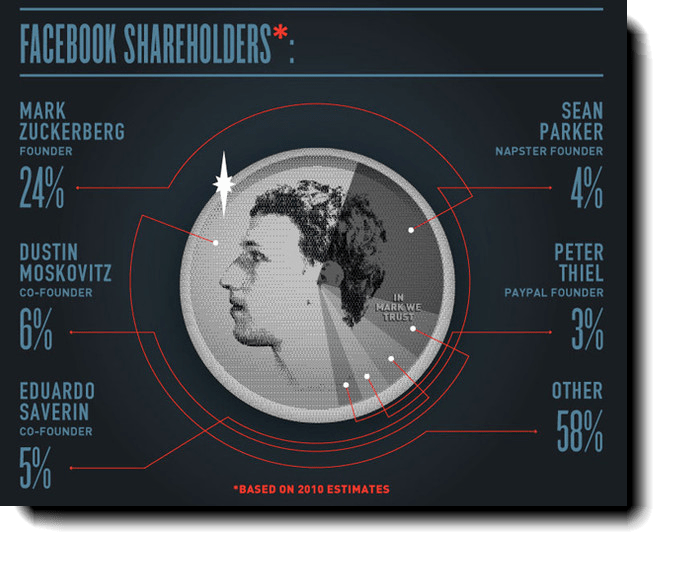 Facebook watchers are saying the IPO will net Facebook $10 billion and give Facebook a total value of $100 billion, 24 percent of which belongs to Zuckerberg. It would put him, at age 27 in May, ahead of Steve Jobs’ net worth and the 35th richest American, according to Forbes. It’s enough to boggle the mind, especially the minds of us to whom high finance is how much a nickel bag really costs these days. To unboggle things a bit, AccountingDegreeOnline.net has created a couple of infographics on a scale worthy of Facebook. When you look at the numbers laid out as the graphics do, then it all turns from mind-boggling to mind-blowing. Hold on tight. STILL WITH US? You have to admit, the numbers are impressive, but not surprising. By the end of 2012, Facebook will have signed up more than a tenth of the world’s population. If Facebook were a nation, it would be the world’s third largest, behind only China and India. It already controls 28 percent of the ads on the Internet, and a sixth of all display ad revenue in the U.S.
Kind of makes you wish you had gone to Harvard–so you, too, could drop out and turn your hobby into a multi-billion dollar international business. Not bad for a free service ehh! If only Facebook would be a pal and give its users a little piece of the pie for sharing so much personal information with the social giant! Hey, perhaps groovyPost readers could start something here — Occupy Facebook! Give us some cash for all the privacy data we’ve shared with you over the years or we will not just deactivate our accounts, we will permanently delete them! That’s just sick rich. The interesting thing is, even with Billions he probably works more than all of us combined.